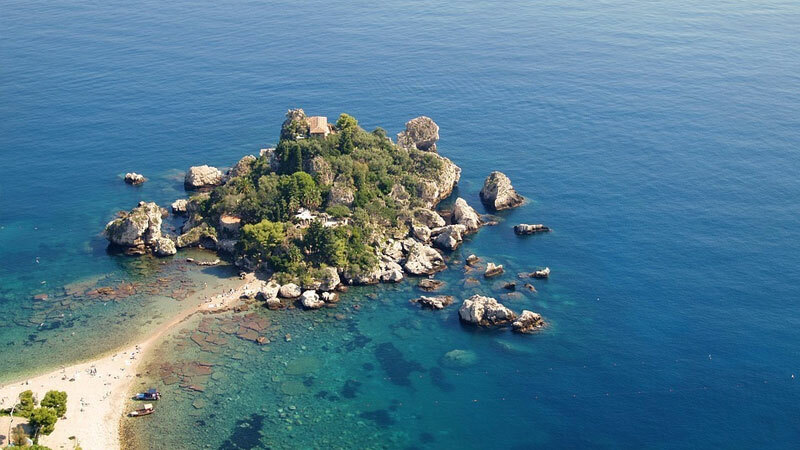 If you have just one day to spend in Sicily, probably Taormina would be the must-see destination to go and see. You can find everything that Sicily has to offer, it is set in an enchanting location where you can easily reach Messina, Catania and the whole Eastern area of Sicily. Nearby, the busy Giardini Naxos has an abundance of restaurants, pizza parlours, shops and beautiful sandy and pebble beaches. A renowned tourist destination, Taormina’s notoriety is due to its splendid position which affords wonderful panoramic views and a particularly mild climate for which this little town became a much sought after winter destination for the European nobility in the past. The first settlements in this area are attributed to the Siculi, a farming and livestock community. However, the origins of Taormina are not clear. The ancient Greeks came here around the seventh century BC when they founded the town of Naxos. Tauromenion, the original name of Monte Tauro, came about when Dionysius I of Syracuse, allied with Sparta during the war against Athens, resettled the colony of Naxos. During the Roman Age, Tauromenium, the Latin name of the town, maintained a particular independence as an allied city, even though it was the site of war by the insurgent slaves against the army of the Roman Consul Publius Rupilius and, later, that of Sextus Pompeius and Octavian. During the ages, the town was conquered by the Arabs, Normans, French, Spanish, and Bourbons and the town, in fact, has an extraordinary archaeological and architectural heritage. The author D.H. Lawrence lived here for some years with his wife and it is where he fell in love with the beautiful almond and olive groves overlooking the Ionian Sea. Lawrence was fascinated by the crisscrossing cart tracks and the view; here he wrote two important works “Snake” and “Sun”, the latter dedicated to a Sicilian land full of sun and colour. The town has named a street in his honour. Taormina was a crossroad for several authors, such as Oscar Wilde and more recently Truman Capote, but also Eighteenth and Nineteenth Century painters. The Art and Grand Tour Museum of the City of Taormina “Casa Cuseni” was set up in 2014 to celebrate the English painter Robert Hawthorn Kitson and all those personalities that sojourned here during their travels. Famous personalities of the time such as Goethe, Nietzsche, Wagner, and Nicholas I of Russia also came to Taormina and probably its reputation as a Sicilian destination began when these influential intellectuals came here, though the 43rd G7 summit held in 2017 also contributed to its international status. This is also a town where breath-taking views, majestic mountains, crystal-clear seas, art and culture meld together in a unique treasure trove where life is to be enjoyed. Take a stroll along Via Nazionale sipping an ice-cold granita looking at the sun shining over the Ionian sea, or walk through the verdant public gardens, or visit the medieval Cathedral dedicated to St. Nicholas of Bari where the baroque fountain in Piazza Duomo greets visitors from the world over. Piazza Duomo is also an easy point to start your shopping, from here you enter Corso Umberto, replete with boutiques and souvenirs shops, as well as restaurants, pizza parlours and cafés for those who love their food. Piazza IX Aprile, the main square in Taormina is about halfway down Corso Umberto, it is flanked by the 17th-century Sicilian baroque Church of San Giuseppe, the former Gothic Church of St Agostino, now a public library, and the many times rebuilt 12th century Torre dell'Orologio. 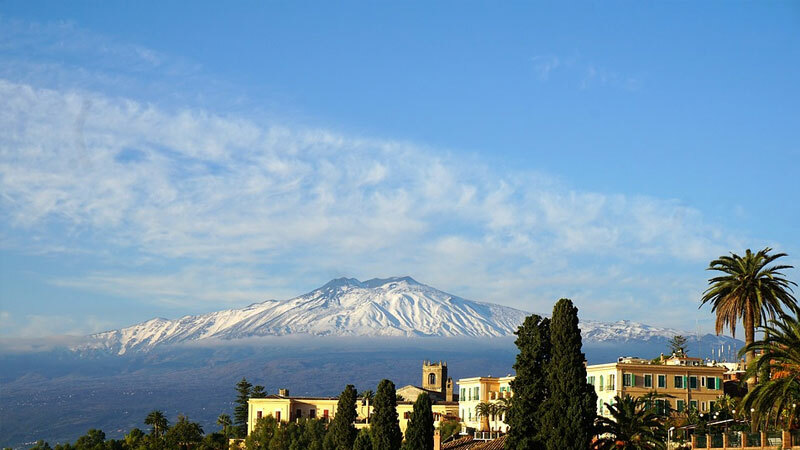 But it also offers a spectacular view of Mount Etna, the biggest active volcano in Europe: here visitors can look out from the terrace and admire this impressive mountain that dominates the whole landscape. The medieval Palazzo Corvaja is at the northern end of the Corso. Arab in origin, the name comes from the family that owned it for more than four centuries. Its peculiarity lies in the various Arab, Norman and Gothic styles. Today the palace is a tourist office and houses the Museo Siciliano di Arte e Tradizioni Popolari, a collection of folk art such as the Sicilian puppets and carts. Probably the best position to enjoy the panorama is from the Saracen Castle. It is not clear when it was built, probably by the Arabs. It is certain they used the fortress during the Norman attack in 1079 AD. Set upon one of the spurs of Monte Tauro, it is not possible to visit because all its interior walls have collapsed, however, you can visit the grounds and wonder at the Taormina coast from above. Another place where you can cherish the Eastern Sicilian shore is from the Ancient Theatre of Taormina, certainly the best-known site to visit. It is a 3rd century BC theatre, originally erected by the Greeks and rebuilt by the Romans. It was initially used for drama and later for games and gladiatorial contests. Today the theatre hosts concerts, shows, award ceremonies and various forms of entertainment. 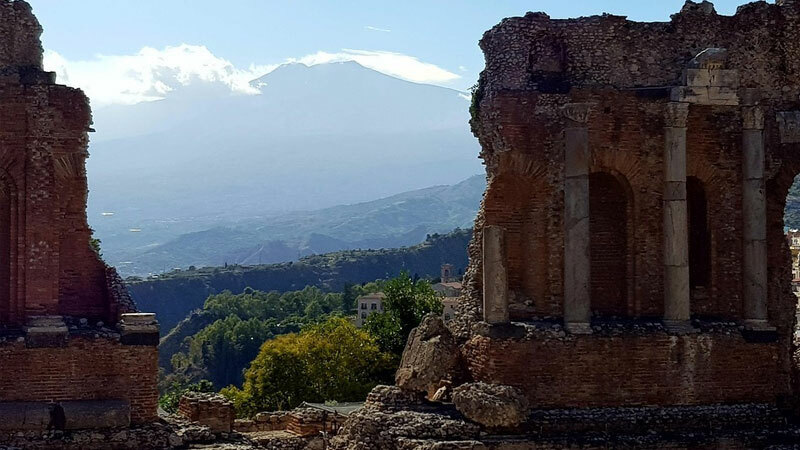 The setting here is spectacular, and not only for exhibitions: looking out from the tribunes of the cavea (or the steps) toward the stage, Mount Etna as well as the Ionian Sea and the entire coast behind frame this unique location that has been well-preserved over the years. Some could simply think that the background is part of a beautiful painting, thus for many the view from the theatre is the perfect photo shoot. Together with the Greek Theatre of Siracusa, this theatre represents proof of what ancient cultures left us. The coast around Taormina is dotted with many beaches, both sandy and with pebbles. One of them is located in a bay that is simply a jewel and represents the reason why many visitors from all over the world come to visit Isola Bella. The “Beautiful Island”, named also The Pearl of The Ionian Sea, it is a small island that can be reached by cable car or simply by walking a narrow path from the beach situated in front of it. After the Regional Government purchased it in the 90’s it has been a WWF nature reserve and hosts several birds species and some lizards. Previously the island was in the ownership of Florence Trevelyan, an English noblewoman who contributed to re-populating animal species and plants, even with non-native examples. The marine environment here is very rich in flora and fauna while its seabed contains archaeological evidence and wrecks. On the whole, the ecosystem is well-preserved from the impact of human activity, thus, the isle is situated in a natural setting for the enjoyment of visitors. Because of this, Isola Bella was nominated by the European Commission a Site of Community Importance. The island is also very close to the coast, in the event of low tide it becomes an easily reached peninsula. It is also possible to visit the bay by boat and circumnavigate the island, an extra opportunity to relax and enjoy the peaceful atmosphere.